Commonly referred to as the F-Scale, the Fujita Scale is used to rate the intensity of a tornado. The scale considers the intensity as demonstrated in the damage left in the path of the storm. 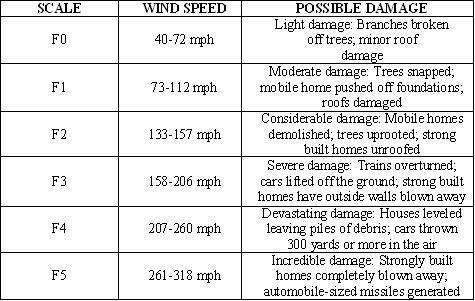 The proper scale rating is assigned by meteorologists and engineers upon surveying the damage and inspected all reports after a tornado has touched down. Affected by a Tornado? What was it Like? Just How Bad Was It? We Want to Hear about It! TELL US! !